Upon discovering a cassette copy of Positronic Neural Pathways (32'12") in a pile of old tapes, one would have to check its recording date to know that it was from the 21st century. On this C30 sized album Steve Moore confronts the era head-on - with six tracks of sacred synthesized relics. Rather than sliding his way through data fields Moore begins Positronic Neural Pathways bold and blunt. Speaking to us in the voice of an old friend, the music marches into the listening space - an audible carrier of contemplative messages. Bright chords play above worming synth-bass action and metallic beatbox pulse. 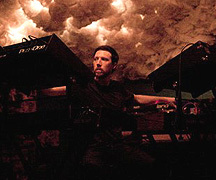 A sensuous melody introduces itself and entices us into a luxurious electronic zone. Moore's upbeat realizations unreel in a kind of radiant synth-demo optimism - until a more serious tone is cast. Positronic Neural Pathways closes with two chillers. 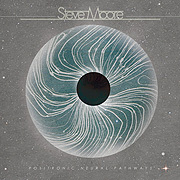 Here Moore turns up the "portent" knob as smart sequencer runs interlock along echoing minor key scales - in anticipation of a closing cosmic premonition. The effect runs along our spines, firing neurons and sparking connections that will inspire deeper curiosity, and make one proud to be an Earthling. Although Moore makes Spacemusic from 30 years ago sound new, maybe we should be listening to this work on its own terms. He hears his world through fresh electronic ears, and has plugged into the adventure in a way few synthesist have. For those of us sentenced to live inside of our own heads, we might as well keep the space sharp - and filled with music of this kind.